In March we facilitated a workshop at Grow Heathrow. It was a lively and interesting debate focused on Civilisation. We talked about why DGR believes the murder of the biosphere is caused by civilisation. Although not all the participants agreed, there was some support, many good questions were asked and the discussion ended with everyone on friendly terms. DGR UK members launched the Rights of Nature UK campaign in June. We are campaigning for nature to have legal rights in the same way as humans and animals. CELDF in the US has successfully supported 30 communities to get Rights of Nature laws enacted. Is a part of nature under threat where you live? If not would you like to help with the campaign? If so get in touch: (campaign@rightsofnature.uk); website; facebook. In July, Lierre Keith spoke in London at the long-awaited Thinking Differently conference (videos to follow soon). Lierre arranged to meet with Radical Feminist activists in London the day after the conference. About twenty women attended to discuss a number of pressing issues, including how the environmental and feminist communities can support each other more in their struggles. Lively discussion ensued with topics ranging from the US election to Teresa May’s swift decision to abolish the Department for Energy and Climate Change. There is growing recognition that environmentalists and feminists along with anti-racists, anti-capitalists and others share a common enemy. It is important that these varying groups build effective alliances. For this to happen, groups need to be open to radical feminist analyses. More joint meetings and exchanges of ideas will follow. DGR Scotland launched in August. They have a facebook group with a website to follow soon. It is an exciting time for DGR Scotland to be taking off with hopes getting higher that we can break from our UK colonial status, from our role of providing a large part of our territory as hunting playground for the rich, with having no say over having UK nuclear subs parked near to our major city and our being dragged into illegal wars. Finally, we’re making a change to how we post DGR UK news. For the last 3 years, we’ve been posting regularly to the DGR UK blog and then sending out very irregular e-newsletters. This is changing so that everyone on the e-newsletter list will get email alerts when we post to the DGR UK blog (which is about once per month) and there won’t be any more e-newsletters. You can of course unsubscribe from these if you wish using the link at the bottom of each notification email. This entry was posted in Education, Women & Radical Feminism and tagged DGR activity & statements, Lierre Keith, Scotland, United Kingdom on September 20, 2016 by Deep Green Resistance UK. From the 31st July to the 3rd August 2014, DGR UK had a stall at this year’s Green Gathering in Chepstowe. As someone new to these kinds of festivals, it’s been an interesting experience for me. I arrived on Wednesday to meet our little group of people, and help with setup. The sun was shining, we chatted, put up tents and gazebos, pondered our stalls and watched the rest of the gathering being built. More traders, and public, arrived on Thursday, and bit by bit the fields were taken over by all manner of structures, tents and vehicles. We even got a quick talk about how a large marquee is set up. But for all the material things appearing, a gathering is as much held together by the people and the causes they represent. And there were many; a physical manifestation of all that needs fixing in the world, but also of all the goodwill that is there to fix it. And there was a lot. Not only places and workshops to inform yourself and increase your skills, but also many spontaneous encounters with worthwhile, interesting and kind people, and unfortunately much too little time to explore it all. For DGR UK this has meant a successful workshop, many people talked with at our stall, and many connections made and explored. After the gathering a website for the ‘Resisting Together’ group was launched, to supplement the existing Facebook group and provide information for people who aren’t on Facebook. For myself, I have learned a lot about how such a gathering functions, about how to talk to people, and about a lot of the many problems civilisation causes, and the many projects that need help. I’ve also been reminded just how different life can be from the ‘normal’ civilised world most people live in. Even though it was just a very small patch of the world and just a short amount of time, and we still relied on so much of civilisation to make it happen, it’s far enough removed, and different enough, that going back home, sitting on the train, locking my door behind me at home, feels like a culture shock. This entry was posted in Education, Movement Building & Support and tagged DGR activity & statements, Deep Green Resistance, Wales on August 24, 2014 by Dorothea Deppe. Its been a while since the last DGR UK newsletter in Autumn 2013. In Decmber DGR member from across Europe met in London and formed the DGR EUMENA (EU, Middle East, North Africa) regional group. In January, we posted an Open Letter to the UK Environmental Movement from Deep Green Resistance UK on our blog. Please share with your networks. DGR UK members and Keith Farnish organised a Resisting Together event in Edinburgh on March 29th. A Resisting Together facebook discussion group has just been set up. Adam ran a workshop at the Power Shift UK conference at 3pm on May 3rd in London. The workshop was titled ‘Diversity of Tactics’ and looked at the need for the environmental movement to start being more strategic. DGR UK members met up for a camping weekend in Nottinghamshire from June 13-15th. A broader anti civ wild camping week is planned for the end of September in Skye, Scotland. Adam gave a DGR talk with Q+A on June 21st as part of Bristol Big Green Week. There will be a DGR UK stall at the Green Gathering in Chepstow from July 31st to August 3rd. Adam will run the Diversity of Tactic workshop on Friday at the Green Gathering in the Off Grid College. This entry was posted in Education, Movement Building & Support and tagged Adam Herriott, DGR activity & statements, United Kingdom on July 7, 2014 by Deep Green Resistance UK. On December 14th and 15th 2013, eight DGR members from across Europe met for the first DGR EUMENA (Europe, Middle East, North Africa) gathering. This group agreed to form the DGR EUMENA regional group. DGR members were present from DGR Slovenia, DGR Canary Islands and DGR UK. DGR EUMENA will now start work on growing DGR in the EUMENA region and facilitate the creation of national chapters in other EUMENA countries. This entry was posted in Movement Building & Support and tagged DGR activity & statements, Deep Green Resistance on January 10, 2014 by Deep Green Resistance UK. DGR UK members had a busy August. We ran a DGR UK stall at the Green Gathering and ran a workshop on Derrick Jensen’s Endgame Premises. Adam was involved in organising the Earth First! Summer Gathering and ran a session on DGR during the gathering. This was a very useful and rewarding discussion. Lucy was part of the group that set up Reclaim the Power camp on farmland near the Balcombe Community Protection Camp that ran from August 16th-21st. Lucy also took part in the action at Cuadrilla’s headquarters in Liltchfield, north of Birmingham. Adam also attended the Dark Mountain Project’s last Uncivilisation festival and ran a DGR session there. Lucy joined with other anti-nuclear campaigners in an over night “swoop” to help establish the Action AWE camp at the UK’s Atomic Weapons Establishment (AWE) Burghfield just south of Reading, in Berkshire. This ran for two weeks from 26 August. This is part of a three year campaign in resistance to the 100 billion the government is spending by 2016 on renewing Trident – Britain’s nuclear missile system. The big day of action was on 2nd September. People from all over Europe attended and there were over 20 arrests. DGR UK members were recently at the Balcombe Community Protection Camp. DGR UK will be running a stall at the London Anarchist Bookfair on Saturday 19th October and at the Manchester Anarchist Bookfair on Saturday 23rd November. So if you can make it down to one of those then please come and say hello. DGR UK members in Bristol are running an Anti Civilisation Reading Group (http://bristol.indymedia.org.uk/article/766886) and Anti Civilisation Film Series (https://www.facebook.com/pages/Bristol-Anti-Civilisation-Film-Series/656376291048501). A recent blog post on shows that underground work has been taking place in the UK for years. There are two new pages on the DGR UK website. DGR UK has been asked a number of similar question by interested parties and other activists so we have decided to respond to these with a DGR UK FAQs page. There is now also a Resources page which lists recommended reading and viewing related to DGR. The Security page on the DGR UK website has been updated. 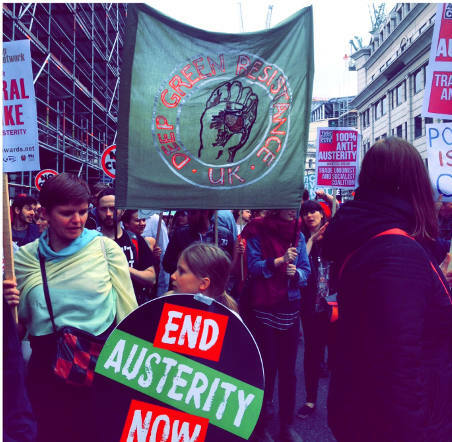 This entry was posted in Education, Movement Building & Support and tagged DGR activity & statements, Deep Green Resistance on October 12, 2013 by Deep Green Resistance UK.